My basement is almost clean. I mopped yesterday, so technically it's done, but I think I will tinker around for one more day before the big photo shoot. I think you will notice a difference. It really hasn't been that bad. Kinda like taking medicine. I hardly got rid of anything - just found a place for it. Anyway. Before I got buried in all that I put away my Christmas trees. Except I wanted to keep some of them out - because I like looking at them. They are really just trees after all. I put them on my mantel. They are perfect for winter. And it will be winter here for a long, long time. This is also the debut of my first cloche. I feel so grown up. Holy moly!! I'm looking at the picture now and can see the piece of paper I tucked in because that rough hewn oak fake mantle top thing is very rough and things tend to lean forward or backward, depending on where they are sitting. Anyway. 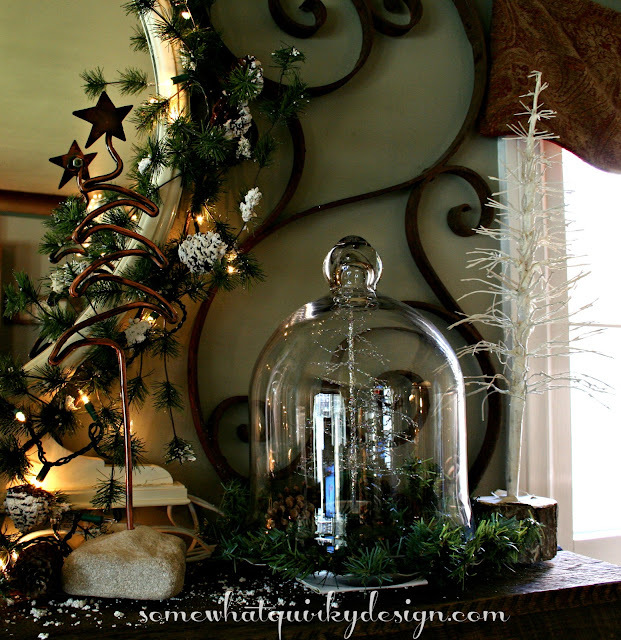 I used the cloche at Christmas as a centerpiece on the dining room table. It promptly got put aside for the realities of living in my house. Putting a centerpiece or table scape on my dining room table might be a little bit like you putting a centerpiece and table scape on your breakfast bar or island in your kitchen. I love this tree that I bought at Target this year. It's so winter fresh! I get one new tree a year. That's it. Can you hear the basement calling my name? I've been ignoring it but it's getting louder. I don't like it when it yells at me. 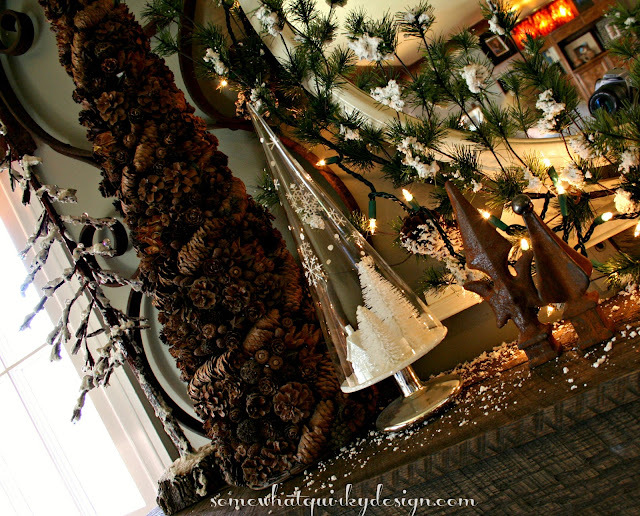 I totally agree that Christmas decorations shouldn't have to go away at Christmas. Winter is such a dark season, I've always thought the twinkly lights should stay out longer. I like all your trees, too. Very pretty. I am a lover of lights! and the rough barn wood framing the fireplace...the mirror and scroll pieces.. All of it goes together so nicely. Beautifully done! Thank you for sharing. You must be a master at organization if you were able to carve out new homes for stuff. I tend to stuff and run, hoping it doesn't fall back out of the spot I stuff stuff in. 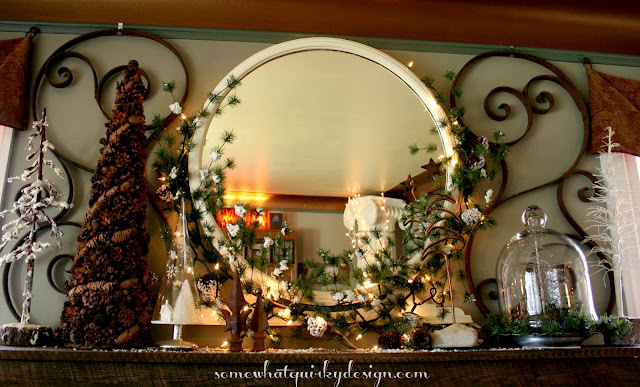 Your mantle is so lovely!! 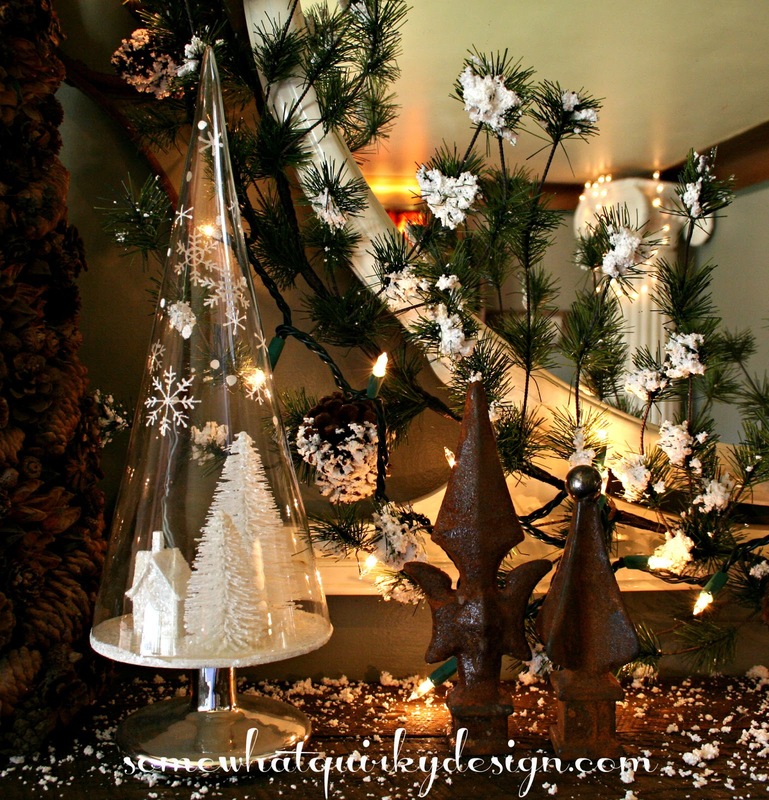 I leave a LOT of my Christmas trees out!! I love your mantle and the Target tree? How did I miss that? 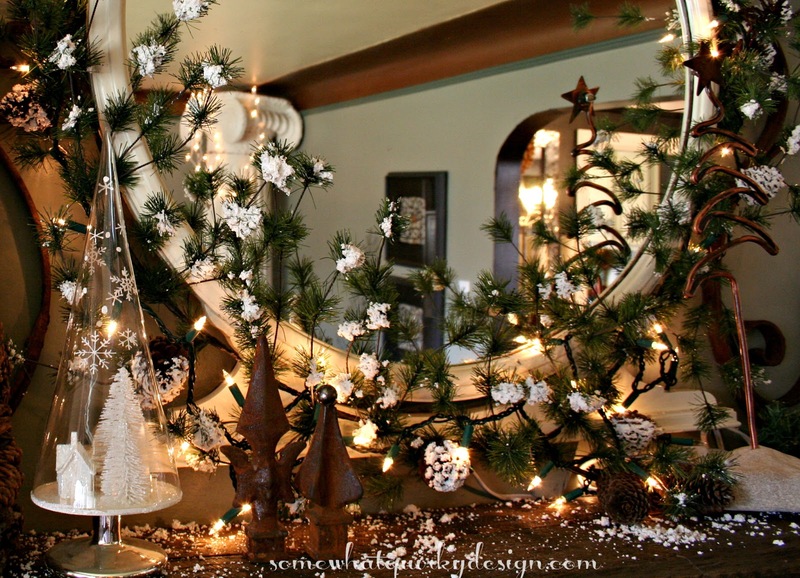 LOVE it, plus all your pinecone trees that I am not patient enough to create for myself. Looks great, Karen. Can't wait to see the reveal. I know I will be totally jealous as I trip over the path of junk in my work room. I hope I get inspired by your progress. If I don't there is certainly something wrong with me. 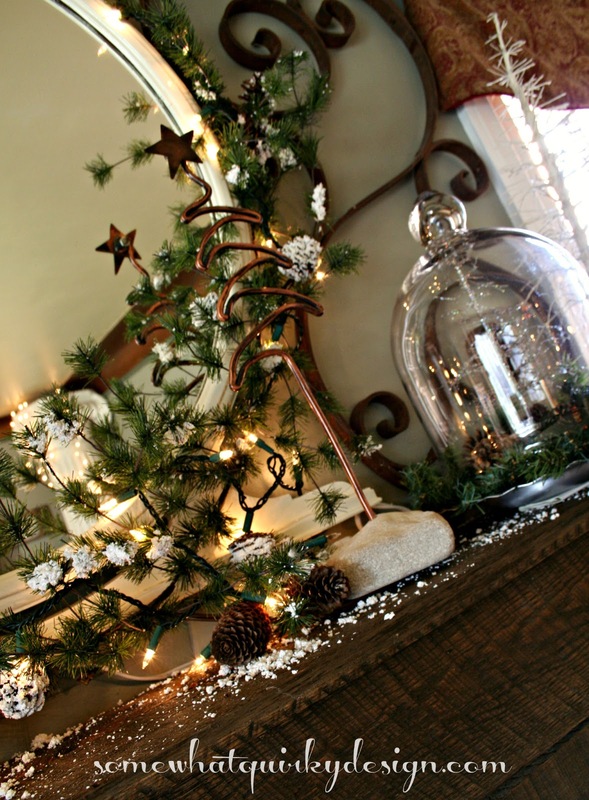 I absolutely love this mantel vignette! Cute post ... 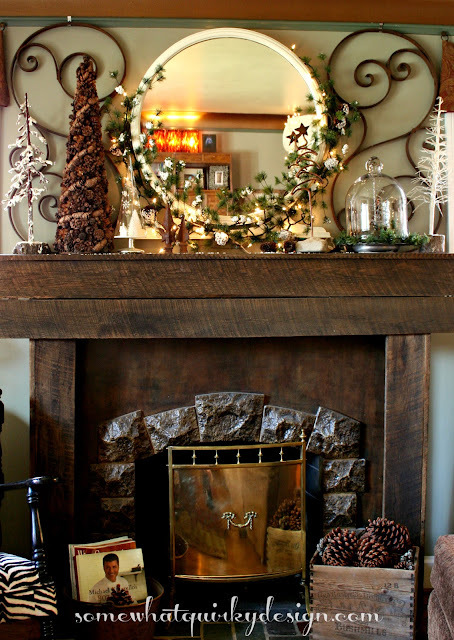 The mantel looks great ... I love your Target tree along with all the others. Good luck with getting the basement just where you want it. I am getting ready to face a HUGE organizing/moving/purging stuff from the Garage to a storage room we are adding.